At the Greater Decatur Chamber of Commerce, we understand the importance of a unified partnership in dealing with business issues that affect our diverse membership. We remain increasingly dedicated to identifying the issues that matter to our members so we can effectively advocate for local business interests at the local, state, and federal level. Our goal is to create a direct impact on the vital needs of the Decatur-Macon County area. 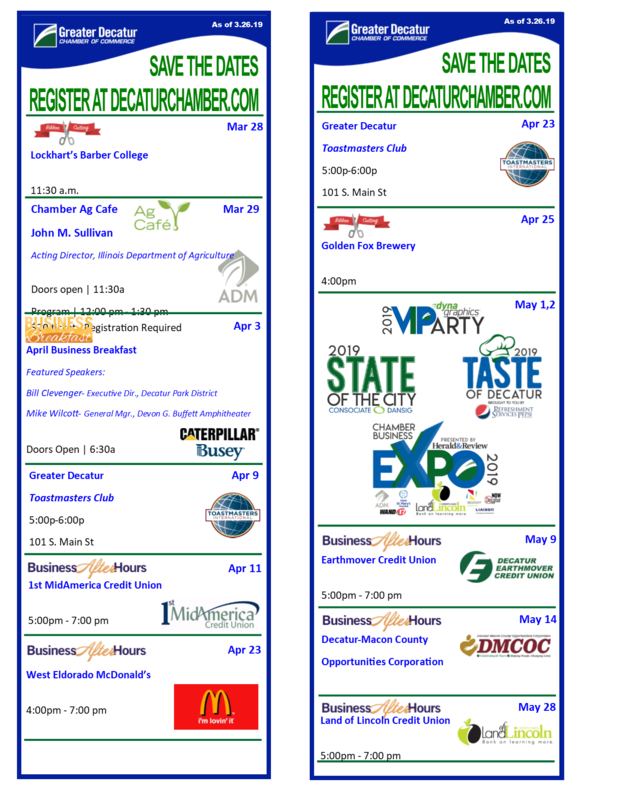 The Greater Decatur Chamber of Commerce is also a member of the Central Illinois Political Action Committee (CIPAC). The purpose of CIPAC is to improve government and business in the state of Illinois by assisting candidates and seeking nomination and election to state and local offices in Illinois. CIPAC is also active in supporting or opposing public policy issues. As always, there have been a large number of bills introduced in the Illinois Legislature. Below are some of the bills we are following that may have an impact on your business directly. HB 3336 provides a sales tax exemption for building materials and machinery and equipment used in the construction and operation of data centers. SB 1863 encourages new investment (Public-Private Partnerships or P3) in several infrastructure areas including public buildings, transportation assets, and other public assets that are in dire need of improvements. SB 1737 amends the Illinois Income Tax Act to allow small businesses to immediately expense property that must be depreciated for federal income tax purposes. A “small business” is a business that has average gross annual sales for the taxable year and 2 previous taxable years of less than $10,000,000. HB 3883 addresses the sunset of the Manufacturers’ Purchase Credit (MPC) by modifying the definition of manufacturing machinery and equipment to include production-related tangible personal property used in a manufacturing operation. The MPC “sunset” by operation of law on Aug. 31, 2014. HB 4020 allows more business to participate in the Illinois EPA’s Registration of Smaller Sources program so they can operate and conduct new construction without obtaining permits. HB 3341 excludes non-road diesel engines from certain emissions permitting requirements. These types of unites are commonly used at power and manufacturing plants to generate electricity and to power pumps and compressors. They were also used in emergencies to produce electricity and pup water for flood and fire control. SB 11 would raise the Illinois minimum wage from $8.25 to $9.00 beginning July 1, 2015 and increases it by $0.50 each July 1 until July 1, 2019, at which point the minimum wage will be $11.00. It denies home rule units except Chicago from having a higher minimum wage than the State and creates a $1,500 per employee income tax credit for employers with fewer than 50 employees. HB 166 creates the Family Leave Insurance Program Act, which requires the Illinois Department of Labor to establish and administer a Family Leave Insurance Program that provides family leave insurance benefits to eligible employees who take unpaid family leave to care for a newborn child, a newly adopted or newly placed foster child, or a family member with a serious health condition. The program is financed by a $2.50 per month fee paid by employees of employers of 50 or more employees. HB 432 requires employers to pay overtime to any employee earning less than $69,000 per year. The weekly or monthly equivalent will increase annually by the percentage of increase in the consumer price index. SB 76,766,767,768 improves the unemployment insurance system by addressing fraud, an improved definition of misconduct, and eligibility requirements. SB 770/HB2418 establish a primary cause standard for determining whether the workplace contributed/caused the injury; defines the scope of “traveling employee” to “employment-related travel” or the injury occurs while actively engaged in the duties of employment.